The Dorelia neck chain features a heavy metal chain and a centerpiece of five large cubic zirconia stones framed in a classic setting. 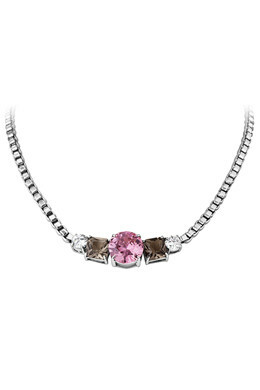 This version is made in polished stainless steel, a silvery finish and sparkling rose and earth coloured stones. Wear really tight or looser - equally beautiful. 45 cm long + extension. Closure on back.